A tea that is increasing in popularity due to it's unique warming character a delicious spice combination. If you haven't tried Chai yet, we highly recommend it; A superb organic tea blended with warming spices to deliver a richly refreshing flavour. Try it with milk and sugar as an afternoon treat. 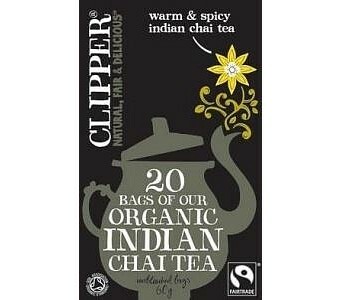 Ingredients: *Fairtrade Tea, *Fairtrade cinnamon (17%), *lemon peel, *Fairtrade cloves (8%), *fennel seeds (5%). *Organically grown ingredient.